Since the 1980s anti-homeless laws that criminalize sleeping, sitting, and panhandling in public spaces have increased across the nation, most rapidly in the last ten years. Since 1987 members of the San Francisco Coalition on Homelessness (COH) have gone on weekly outreaches reporting on the impacts of criminalization and advocating for policy change, while also offering legal services of citation defense. Yet policymakers and the public were often skeptical of these anecdotal stories of what was essentially an invisiblized process of punishment, with no city agency tracking arrests, citations, or move-along orders aimed at the unhoused let alone investigating their impacts. Our project documented and analyzed the impacts of this rising tide of anti-homeless laws in an era of mass incarceration on those experiencing homelessness in San Francisco; a city with more anti-homeless laws on its books than any other California city. With Dilara Yarbrough of San Francisco State University, and Human Rights Workgroup leader Lisa Marie-Alattore I co-directed a community-based study with the The San Francisco Coalition on Homelessness. Together we carried out a citywide survey of 351 homeless individuals and 43 in-depth interviews. We also collected and analyzed data obtained from public record requests on policy protocols, citations, and sanitation sweeps from various city departments. The survey and interview instruments were directed by COH’s Human Rights Working Group; surveys were conducted by coalition volunteers, and the in-depth video interviews were completed by a team of five currently or formerly unhoused peer researchers. The academic partners translated the working group’s questions and goals into a rigorous research design and provided training and direct guidance through the data collection phase. Academic partners completed the technical aspects of statistical analysis and report writing, but the interpretation, presentation of findings, and recommendations were formed through a consensus-based process of the COH’s working group of which the academics were both members. The findings resulted in an in-depth report and a 15-minute video documentary featuring a selection of interviews completed by the peer research team. The report provides an in-depth analysis of each step in the criminalization of homelessness –interactions with law enforcement, the issuance and processing of citations, incarceration and release – demonstrating how criminalizing homelessness not only fails to reduce it in public space, but actually perpetuates homelessness, inequality, and poverty. The video provides powerful testimony to the analysis. Just as our organizing priorities informed our research questions, these findings have informed our policy advocacy. The project not only helped us systematically answer empirical research questions, but worked as a tool for political organizing, established homeless people and the COH as experts, and created research products directly to impact policy change. Despite many challenges, we believe that in many cases community based participatory research can provide superior data, more precise analysis, and broader impact than traditional academic studies lacking grassroots partnerships. This page contains a range of materials produced through this study as well as related resources for advocates, lawyers, and scholars. This report documents and analyzes the impacts of the rising tide of anti-homeless laws in an era of mass incarceration on those experiencing homelessness in San Francisco drawing on findings from a citywide survey of 351 homeless individuals and 43 in-depth interviews carried out by volunteers at the Coalition on Homelessness and supervised by researchers at the UC Berkeley Center on Human Rights. We also analyze data from public record requests on policy, citations, and arrests received from the San Francisco Police Department, Sheriff ’s Office, Human Services Agency, Probations, and Recreation and Park Department. The report provides an in-depth analysis of each step in the criminalization of homelessness — from interactions with law enforcement, to the issuance and processing of citations, to incarceration and release – and makes evident how criminalization not only fails to reduce homelessness in public space, but also perpetuates homelessness, racial and gender inequality, and poverty. Under Review. with Lisa Marie Alatorre, Jennifer Friedenbach, Bilal Ali, TJ Johnston, and Dilara Yarbrough. In S. Greenbaum and P. Zinn (eds), Outside the Ivory Tower: Collaborative Research and Community Action. New Brunswick: Rutgers University Press. Formed in 1987, the San Francisco Coalition on Homelessness has been organizing against the criminalization of poverty for over 20 years. In collaboration with sociologists, we conducted a PAR study about the effects of the criminalization of homelessness in San Francisco. This chapter discusses 1) how our participatory research process enhanced the quality of data and worked as a vehicle for organizing 2) how our project impacted the organization, city, and narrative on the criminalization of homelessness and 3) how we confronted assumptions about expertise as we worked to establish homeless people as leaders and experts in the local policy arena. Our successes, struggles, and process will be useful to other researchers and organizers designing and implementing projects that establish the expertise and leadership of directly affected communities. Pervasive Penality: How the Criminalization of Homelessness Perpetuates Poverty. Forthcoming in Social Problems. with Dilara Yarbrough and Lisa Marie Alatorre. A growing literature is looking beyond incarceration to understand the extent to which the criminal justice system perpetuates poverty and inequality. This paper examines how anti-homeless laws, the most prominent and rapidly growing subset of quality of life laws in US cities today, produces various forms of police interactions that fall short of arrest, yet have wide-ranging impacts on the urban poor. 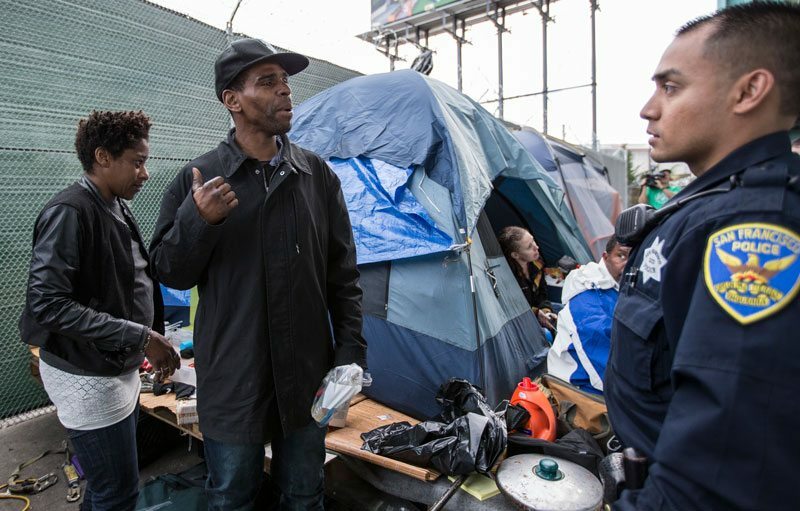 Because such interactions are largely untracked by the state, and in turn under-scrutinized by scholars, our study provides one of the first assessments of the effects of quality-of-life policing on marginalized groups drawing on a citywide survey of those who have recently experienced homelessness along with 43-in-depth interviews. Our analysis elaborates the mechanisms through which consistent punitive interactions, including move-along orders, citations and destruction of property systematically limit homeless people’s access to services, housing, and jobs, while damaging their health, safety, and well-being. Our findings also suggest that anti-homeless laws and enforcement fail to deliver on their promise of reducing urban disorder, instead creating a spatial churn in which homeless people circulate between neighborhoods and police jurisdictions rather than leaving public space. We argue that these laws and their enforcement, which affected the majority of study participants, constitute a larger process of pervasive penality - consistent punitive interactions with state officials that most often do not result in arrest, but nonetheless exact widespread and deep material and psychological harm. This process not only reproduces homelessness, but also deepens racial, gender, and health inequalities among the urban poor. The Study's publication convinced City Supervisor Eric Mar that a Legislative Analyst Report (City Hall’s Internal and Independent Consultant/Research Group) should be completed on the costs of criminalizing homelessness in San Francisco. The report found that the City of San Francisco spends $20.5 million on enforcing quality of life laws against the homeless. Since the publication of our findings and meeting with the District Attorney over 30,000 warrants were dismissed for quality of life violations, warrants are no longer being issued for unpaid fines related to these violations nor are driver’s licenses being revoked due in part to our discoveries. The research is being used and cited in a class action lawsuit suing the city for the destruction of homeless people’s personal belongings by the San Francisco. The report resulted in a task-force working with community stakeholders on reducing call volumes by reforming dispatch, reducing citations, and extending public education on our findings. Over the past two years, citations have been reduced nearly 30%. The report motivated the first proposed legislation in the city of San Francisco’s history to partially decriminalize homelessness. The legislation, drafted in part by the authors, was designed to halt the destruction of property, require the city to post warning before camp evictions, offer shelter, housing, or an alternative safe location before issuing citations, and provide garbage removal and port-a-potty’s to encampments, thus resolving public health emergencies rather than simply declaring them to force eviction. This legislation is currently on hold. From meetings with City Supervisors on the report, four wrote letters of support for the Senate Bill SB608 that would set a moratorium on existing anti-homeless laws across the State. The presentation to the Public Defender Jeff Adachi resulted in a partnership with the Coalition to work on civil rights issues of those who cannot afford bail in the jail. The report presentation with SFPD Chief Suhr resulted in the issuance of a general order to his officers, reminding them of the procedures of search and seizure of homeless person’s property. The report presentations to the Potrero Democratic Club and Harvey Milk Democratic Club resulted in formal endorsements of California State Senate Bill SB608 “The Right to Rest Act” and support for city legislation ending the criminalization of homelessness. The report established the SF Coalition on Homelessness as a policy expert on the topic of the criminalization of homelessness in a way the organization had never been considered. This was evidenced by their invitations to present on the issue and access to certain agencies and offices they had not previously been able to reach (such as the District Attorney, Public Defender, and Police Chief). At the year-end roundtable of what had been the biggest impact of the report, the most common answer was the new legitimacy of their organizing goals and claims about the criminalization of homelessness and a new legitimacy of their organization in having executed such a study. The presentations of the report (see presentation list), helped build new community partnerships that had not been established (ie the Democratic Clubs and the Probation’s Re-entry council). The survey research process itself proved a useful organizing tool for the Coalition, educating 350 homeless people who were surveyed on the issues of criminalization, provided basic know-your-rights info, and the work of the Coalition. The interview process for homeless peer researchers, many of whom were organizers, provided personal skills and training as well as increased the organizational capacity of the Coalition. The report and video raised public awareness of the Coalition’s work and the issue through media response (see page listing Media Coverage). 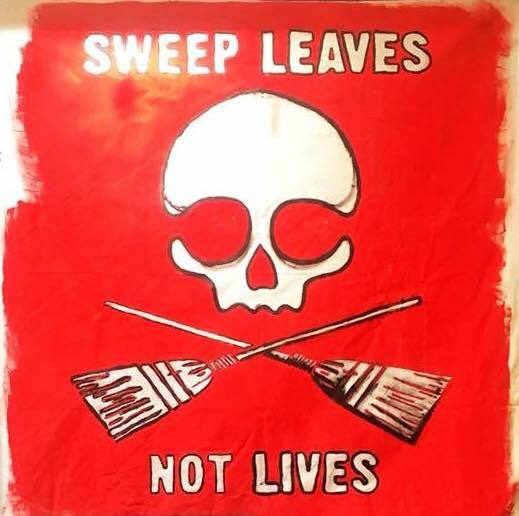 Has helped change some media discourse from one of “quality of life” issues of the housed to human rights issues of homelessness – as seen in the recent mainstream news coverage of the “Homeless Sweeps” surrounding the Superbowl. “Study Calls for an end to Criminalizing Homelessness,” Joshua Sabitini. San Francisco Examiner. April 25, 2016. “San Francisco’s Homeless Policies Have Been a $1.5 Billion Failure,” Jeremy Lybarger. SF Weekly. June 18, 2015..
“From Poverty to Prison – A New Report on Poverty Crimes is Released while a New Jail for us Poor People is Proposed” Lisa Gray-Garcia. Poor Magazine. June 20, 2015: . “More Proof That Housing Homeless People Actually Saves Money and Works.” Eleanor Goldberg. Huffington Post. June 25, 2015. “Punishing the Poorest: How the Criminalization of Homelessness Perpetuates Poverty in San Francisco” Bilal Ali. San Francisco Bay View: National Black Newspaper. June 29, 2015. “Anti-Homeless Laws Push People Further into Poverty” TJ Johnston. Street Spirit. July 13, 2015. Quoted in “San Francisco’s Summer of Urine and Drug-Addicted Homeless.” Debra J. Saunders. San Francisco Chronicle. August 9, 2015. “Newsmaker Interview: Homelessness in San Francisco.” KPIX TV and San Jose Mercury. August 30, 2015. “Mayor Ed Lee’s Statement on Relocating Homeless Before Super Bowl Reignites Debate.” KQED Forum with Michael Krasny. August 31, 2015. “Deadline Approaches for San Francisco Homeless to Leave Division Street Encampment.” KQED Forum with Michael Krasny. February 26, 2016. Appearance on "Let's Get Political: A public access television series about progressive politics and activism in San Francisco, CA. In episode 2 of Let's Get Political, we meet with Amy Farah Weiss, Founder/Director of the Saint Francis Homelessness Challenge and Chris Herring, Ph.D. Candidate in Sociology at UC Berkeley to discuss ‪homelessness‬ in SF, the ‪‎state of emergency‬, navigation centers and what ‪Mayor Lee‬ is or is not doing about the crisis.